Today I did my first ever parkrun around Braunstone Park in Leicester. It also happened to be the first time I’ve run with other people since I started running at the end of September 2013, so it was quite a different experience. It’s only a 20 minute drive to Braunstone Park from where I live so it’s not necessary to get up too early, but it’s advisable to be there for around 08:45 to give you a bit of time to warm up before the actual run. When I got there it was quite chilly, yet I still didn’t think to warm up before the run. As it was my first parkrun I wasn’t totally sure how it worked, but I had my barcode ready to ensure I could get a time recorded at the end. Fortunately a friend from work was also doing the run, and her being an experienced runner who has worked really hard, was able to quickly let me know what happens with a parkrun. We all gathered at the start line, which in hindsight I realise I was probably standing too close to the front of the pack, and was quickly briefed on the conditions of the route. There would be mud, open water, and strong winds could mean branches may fall across the track. With no more preparation that that, we were off. For the first mile I pretty much kept my position amongst the others and did the first mile in 6 minutes 11 seconds. The route itself is about 2.5K so has two laps of the park in order to make it up to a 5K run. For the most part, the route is across the path that leads around the park, but once passed the lake (the open water they mentioned) there is a muddy section (which is only done once) which can slow your pace a bit – especially if you start to slip in it. By the time I was about a third of the way around the second lap, and into the third mile I found I could no longer keep the pace I had been going at and slowed down considerably. There were a few points along this last mile that I was tempted to stop; seriously tempted to stop, and there was about a second (or a few steps) when I’d slowed to a walk before deciding I had to finish this. Usually when running you should aim for either an even split, or a negative split. What this means is that each “split” (which in this case is a mile) is done in approximately the same time if doing an even split, or if doing a negative split it gradually gets faster. So what this means is that I’d failed to do either as I had started too quickly and couldn’t maintain the speed at the end of the run. Sure enough I carried on and finished 33rd out of a group of 196 people running this week, giving me a time of 22:08. I was pretty pleased with this result as I don’t think it’s too bad for my first “proper” run. 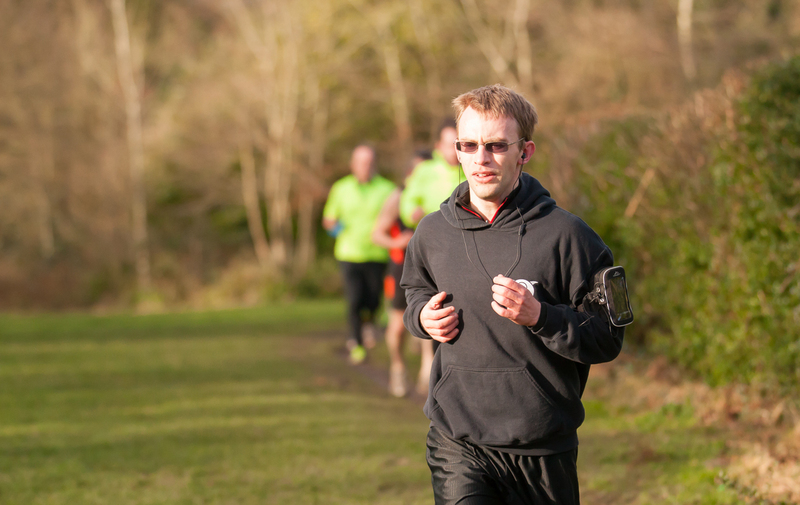 The parkrun I did is just one of many that happen all over the country (and overseas!) every week as a free event which is supported by volunteers. It really is a friendly environment and the team that run the Braunstone Park one were really helpful. Next month I’ll be taking part in a 6 mile run for Sport Relief so it may also be my last parkrun until after that event. If you can, please sponsor me for the run as all money goes to Sport Relief, an initiative set up by Comic Relief to help provide funds to the poor and underprivileged both in the UK and around the world.